waiting for the referee's signal. In this article Al Murray discusses the Olympic pressing style of G. Veres, 1962 world light-heavyweight champion. The author also discusses the loosening of judging standards that has contributed to rising press records. 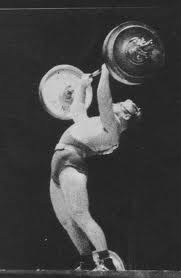 There were many cases of pre-championship jitters before the 1962 World Weightlifting Championships began in Budapest. Why? Because David Webster’s motion pictures had spotlighted some doubtful pressing techniques and the officials had publicly announced that they were going to tighten up their interpretations of the rules. Sure enough, the rules for the press were interpreted strictly for the poor bantamweights and lifts were ruled out one after another. But, as usual, by the time the heavier classes got into action the officials had begun once again to be impressed by how “easily” (meaning fast) the heavy iron was flying up and the officiating pressure was off. 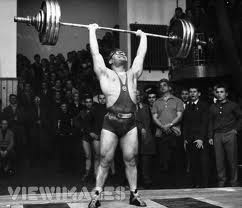 When the light-heavyweights were lifting, officiating was about back to normal and just about anything that went up was “good.” All eyes were on G. Veres, the Hungarian strongman hero, for his pressing style had come in for criticism before the meet when the officials had viewed the films. But despite Oscar State’s noble efforts as General Secretary of the International Federation – he’d been instrumental in showing Webster’s films – Veres, the powerful, well-muscled champion was permitted to “steal” the winning press. I felt sorry for perennial champion Tommy Kono, who lost to a man who lifted in doubtful style. To be fair to Veres, however, I must comment that he is an intelligent, powerful lifter who gets the ultimate form training and lifting technique . . . and does not, after all, referee his own lifting. Veres assumes a good solid, standard starting positioning getting set for the clean: he starts pulling with his back flat, but not vertical, his hips higher than his knees, his shoulders slightly ahead of the bar, and his body’s weight evenly balanced on his firmly- planted feet. He pulls in no uncertain manner; it is obvious that he means business! At the top of his pull he dips by bending both legs to lower his body under the bar without moving his feet and catches the weight at his chest – and remember that the weights he presses represent a very heavy power clean, poundages most champions can’t even can’t clean without splitting or squatting lower. Note that he dips as though he were going to continue into the full squat and then he stops as the weight reaches his chest. He keeps his total weight (including that of the barbell) nicely balanced over the full length of both his feet, sets his hips to the rear and holds his elbows forward to counterbalance the backward tilt of his hips. From here he straightens his legs assumes his starting position, one in which his hips are forward in a somewhat milder bow-like curve than that used by the best Russian pressers. Figure 2 shows Veres’ starting position, with his hip joints set forward under the bar and his legs sloping forward and upward from feet to hips. He holds his elbows slightly forward and his head slightly back so he can make his starting drive straight up. In Figure 3, you will see that Veres – like other top pressers who get the most value from technique – drives the bar past chin-height by extending (straightening) his trunk quickly from the deliberate curve he assumes before pressing. This extension acts like a bow, in coordination with the shoulder and arm drive, to shoot the barbell upward and forward. To compensate, his head moves back. When a lifter is not well-trained in this technique, he will allow himself to continue bending backward, as seen in Figure 4. 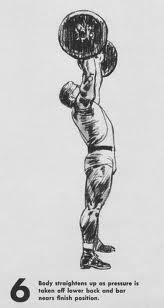 In this illustration, as Veres fights his way through the sticking point, the barbell has perhaps traveled a bit too far back, his hips and thighs being pushed forward to compensate and maintain balance. Note that if Veres continued a straight-up press from Figure 4, the bar would be so far back he wouldn’t be able to bring his trunk erect. You can see this more clearly in Figure 5. While passing through the position shown in Figure 4, the barbell should be eased forward to take the pressure off the lower back and permit a faster recovery to a more erect position. In the lift we are reviewing, Veres was a little late in easing the weight forward, but he did apply the principle. Remember, in your own lifting, that the farther back you bend, the farther you tend to carry the barbell. Therefore, as soon as you get the barbell past the sticking point, you should try to get the barbell forward so you can straighten. But don’t try to ease it away from you until it is past the sticking point, or you won’t be able to keep it moving. Let’s review Veres’ pressing technique, as it is revealed in the accompanying tracings of the Hungarian champion in action: He starts in a solid, well-balanced position, with his hips set well forward and his body arched into a slight bow. 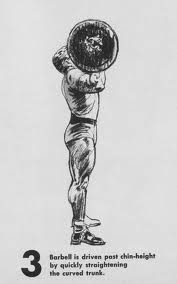 He “kicks” the barbell upward by springing out of the bow and driving with his arms and shoulders, which sends the weight upward and slightly away from him. The barbell returns to a vertical direction, as seen in Figure 3, and as he continues to press it actually moves slightly backward (Figures 6 and 7). In Figure 7 he shows a well-balanced finishing position, waiting for the referee’s signal to lower the weight. I’d like to emphasize again that I’ve seen Veres make some very good presses. Like most heavy pressers, the position of his body gets worse as the weights get heavier. It is up to the referee and judges to disqualify lifters whose body action becomes so extreme as to violate the rules.